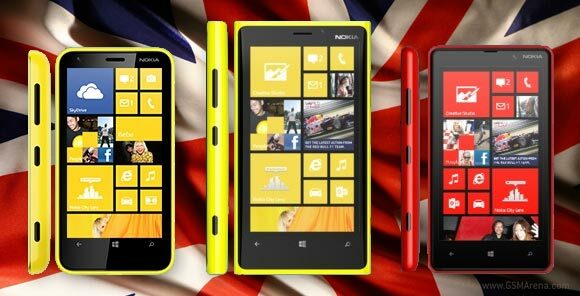 Nokia has officially announced it’s extending the market availability the Lumia 920, Lumia 820 and Lumia 620 in the UK. Throughout January and February next year, the trio of Windows Phone 8 devices will be reaching most major UK carriers and retailers. Currently, the company’s flagship smartphone, the Lumia 920, is available through EE, Orange, T-Mobile and Phones4U, but as of January 2013, it’ll be also available at Vodafone and Three UK. The online retailers Micro- and Carphone Warehouse will also be offering the device. Beginning January 2013, the Lumia 820 will also be joining its bigger brother and will be available at Vodafone with various monthly plan options. The device enjoys wide retail availability through EE, Orange, T-Mobile, O2, Tesco, Phones4U, Carphone Warehouse and Micro-P, but as of next month, its reach will be extended further. Finally, the Lumia 620 will launch in February next year at Vodafone, O2, Three UK, Virgin Mobile, Carphone Warehouse, Phones4U and via Micro-P. Its pricing isn’t yet known, but we’ll keep you in touch once it gets announced. And then you woke up and figured out that you're now a grownup and that quality, stability and work flow suddenly is important. You come to the realization that the phones you mentioned gives you the most value for your Money.